All Makes Office Equipment Co, a 93-year-old, fourth-generation family-owned business has launched a campaign to donate $500 to the Women’s Career Advancement in Omaha. Now through January 23rd, All Makes will donate $5 for every “like” that they receive on the All Makes’ Facebook http://www.facebook.com/allmakesoffice page, up to $500. The Women’s Center for Advancement’s (formerly known as the YWCA-Omaha) mission is to help women and their families build lives of strength, growth and self-sufficiency. The mission is achieved through programs and services that include violence and assault advocacy and intervention, career and economic empowerment services, counseling services, preventive training education, as well as nonviolence programs. Employing 110 members, All Makes Office Equipment Co. is headquartered in Omaha, NE and has branch locations in Lincoln, NE and operations in Urbandale (Des Moines), IA. All Makes opened in 1918 and has been recognized nationally as a “Top 50 Dealer” numerous times. Today, All Makes is one of the country’s largest contract office furniture dealers with customers in all 50 states as well as several foreign countries and offers a full menu of value-added services. The Omaha showroom is the size of half a city block featuring the most extensive product selection in the industry. 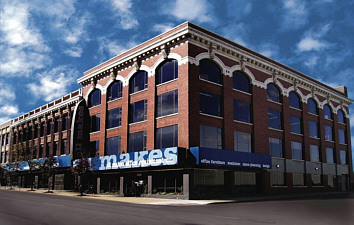 Visit All Makes Office Equipment Co. at www.allmakes.com or call (402) 341-2413.